Yesterday I went to lunch – and it was free. Really free. 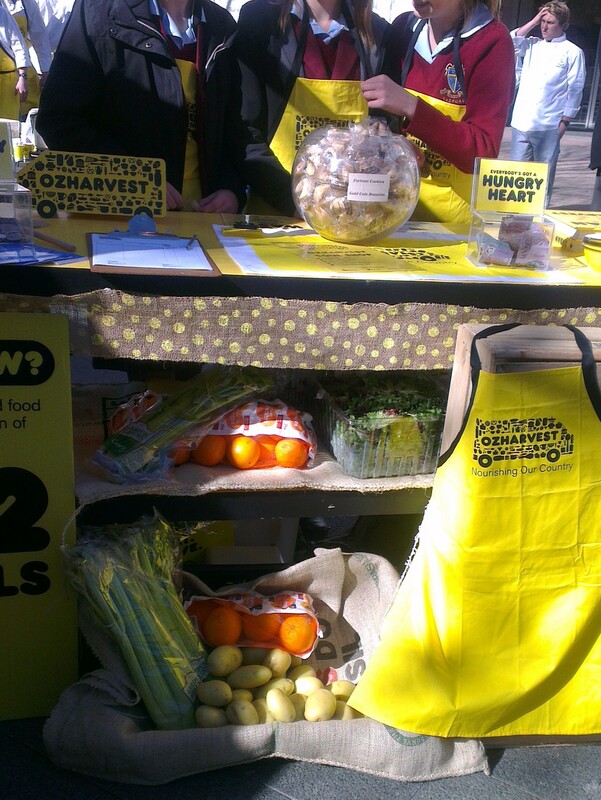 And all to raise awareness of a good cause, namely the importance of reducing food waste, and the work of OzHarvest. The lunch was Think Eat Save hosted by OzHarvest. It is an annual event to bring the community together and focus on the importance of reducing food waste. And in Australia we waste a lot of food, shockingly more than $10 billion annually. The lunch at Garema Place in Canberra was one of many organised around Australia. People were urged to register online beforehand, but there was plenty of food to go around. Eight soups in total, in fact, prepared by chefs from many leading hotels around Canberra. And all were made from rescued food supplies. I started with a generous cup of potato and broccoli soup, topped with parmesan and crisp bacon. Delish. Feeling a bit greedy, I went back for seconds and choose a beef broth, which was chock full of healthy vegetables like kale and had interesting short noodles in it. That was my favourite. My food blogger friend Eileen from The Food Avenue raved about the sweet potato and coconut soup. Someone else said the potato and leek soup was good. There was a lot to choose from. It is often said that there is no such thing as a free lunch, so I was waiting for the catch. Why were we invited here? Would I be hit by a sob story and a demand for cash? Actually, it truly was free. And everyone was so delightfully happy and eager to serve, from the chefs themselves to the school kids who volunteered to assist. There was a box for donations (you got a free fortune cookie if you gave $2 or more), and they were also selling OzHarvest cookbooks. But the event was more about raising awareness than seeking to attract cash. He swept his arms around dramatically at two trestle tables laden with fresh fruit and vegetables, which I had assumed were just for show. “All of this, all perfectly good, is all from rescued food,” he said. None of it looked old, all looked fresh, it was quite frankly hard to believe. It was a strong community event, and Garema Place was a sea of yellow with smiley people with yellow placards encouraging people to go to the soup stall. Two schools were actively involved as well, and it was great to see how enthusiastic the students were in becoming involved. OzHarvest supports 600 charities in Sydney, Adelaide, Brisbane, Canberra, Gold Coast, Melbourne, Newcastle and Perth. I love OzHarvest. They are excellent! Alysha, I see their yellow trucks around but this was the first time I really got to understand a bit more about what they do. It was an inclusive and welcoming community event. When are you headed out in the van?